Adelphi University’s campus is beautiful, and comes with a lot of perks as well. The school provides a space for students to relieve their stress, whether by going to gym or yoga class, which are provided free of charge. When you enroll in college, your life gets loaded down with a lot of work, which can lead to a lot of stress. Sometimes students have trouble managing the workload and life balance, which Adelphi acknowledges. In addition, the campus is a place where everyone is accepted and included in all social events. No matter what your background, race, or gender, you are accepted and treated like a family. Their dorms are also very cool, and each residence has its own theme - for example, one had the theme of "Haunted House," so the students there had decorated their rooms to make it look scary. Each residence also hosts lots of parties, where anyone on campus can attend. 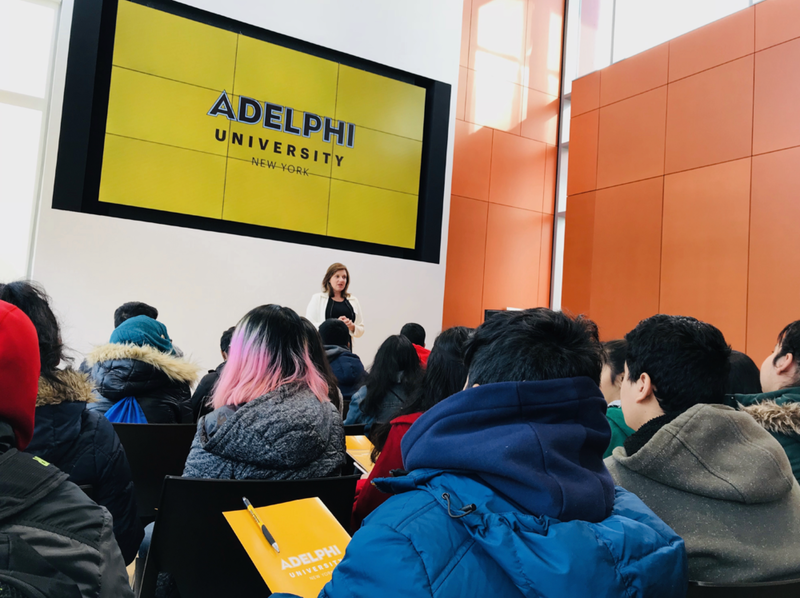 Overall, Adelphi was an amazing university, and it provides a lot of scholarships for diligent students. I really enjoyed visiting, and learning so much about it. If you work hard, you can make it in! For me, the most exciting part of our trip to Stony Brook University was meeting our tour guide. She was a graduate of my high school, which gave me a good vibe. I also enjoyed exploring inside the college, especially the different offices and rooms - that was interesting too. We talked about how this college is predominantly a Caucasian school, which made me think about how my college experience would be shaped if I attended, since I currently live in the most diverse city on the planet and attend Brooklyn Tech, one of the most diverse schools in the city. I didn’t love the buildings on campus, since most of them were under renovation. Something that I will also consider when applying for colleges is the population size of the school - with the school's massive student body of sixteen thousand and a student to teacher ratio of eighteen to one, I will have to think about the personal attention this school will provide me. I enjoyed my time exploring Stony Brook University, with my fellow SAYA students staff members, who provided guidance and answered all of our questions. Thanks to SAYA for making this great opportunity possible for us!